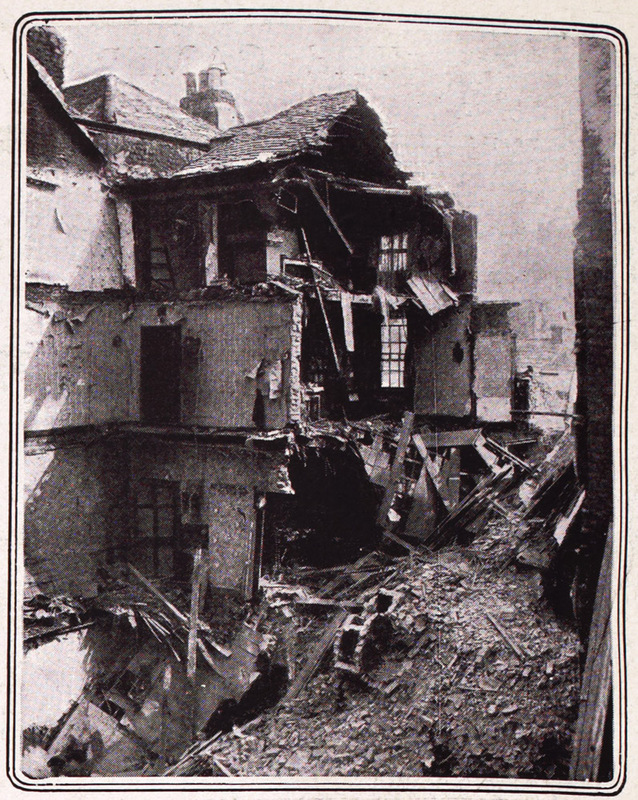 ← Anu’s Laura Murray on her work at 14 Henrietta St.
An Image of the Church Street Tenement Collapse from the Illustrated London News. Image courtesy of The National Library of Ireland. At about 8.45p.m., as dusk approached on the night of Tuesday 2nd September, 1913, two houses, Numbers 66 and 67 Church Street collapsed. The rubble fell across the width of the street as far as the door of the Father Mathew Hall across the road. Perhaps it is ironic, given the nature of the tragedy that unfolded, that the owner of the houses, Mrs Margaret Ryan, and her family ran a lime and sand business at 68½ Church Street, at the rear of the houses that collapsed. Perhaps even more ironic is the fact that Mrs Ryan’s daughter, Mary Leahy, was at that very moment in time collecting the rents from the tenants in the two buildings. It would appear that she was accompanied by her mother and brother, Patrick Ryan. Her husband Michael Leahy was talking to Jack Kelly, the caretaker at the door of the Father Mathew Hall. Later evidence to the Coroner’s Inquiry stated that there had been a rumbling noise, after which No. 66 collapsed suddenly, followed soon afterwards by the fall of No. 67. Given the sequence of the collapse, no one was killed in No. 67. All seven who died in the tragedy had lived in No. 66. In this four-storey building had lived 26 people – Mr and Mrs Sammon and five children, Mr and Mrs Shiels and four children, Mr and Mrs Benson, Mrs and Mrs Fitzpatrick and five children and Mrs Fagan and three children. “Nicholas Fitzpatrick, a young lad of about 14 years of age, was in the third story of the house No. 66 when the first rumble was heard. “My mother and my two sisters had just come back from the chapel” he said. “My sister went out again, and my two brothers Andrew and Edward, my father and mother, and my sister Margaret were all in the front room. I was sitting at the window when I heard a queer noise like an engine banging against a carriage, and when I looked round quickly I saw a crack in the wall over the chimney piece. “Run down and see what’s wrong” said my father”. I ran downstairs, and looking into the drawingroom which was under the room where we lived, I saw the street wall open up and bulge out. I shouted out and rushed downstairs. Just as I got to the hall the side wall began rocking and bulging, and I ran into the street…Mr Jack Kelly, who was near the door [of the Father Matthew Hall], caught me and another boy, and pulled us in, and just then there was a terrible loud crash like a quarry blast, and bricks and mortar and glass tumbled into the hall, and we were all thrown down and covered with dust”. The father of Nicholas Fitzpatrick, Nicholas senior, was killed by the falling houses. Nicholas junior’s two brothers Andrew and Edward were rescued from the rubble some two hours after the houses fell. “Eugene took the youngest child (Josephine), aged one year and eight months, and brought her out safely. Then he went back for the other children, and got out with them alright, but it was when he was coming away with Elizabeth that they were struck by the falling masonry and killed”. The collapse of No. 66 provided sufficient warning to the residents in neighbouring No. 67 a chance to escape. Immediately following the collapse of the two houses a “great cloud of dust enveloped the scene for a considerable time, in consequence of which those in the street were unable to measure for the time being what was the magnitude of the awful catastrophe”. Soon units of the Dublin Fire Brigade arrived at the scene and took control of the rescue work. By now the street was completely dark, except for some poor street lamps. In order to aid the rescue workers “the clergy had the front rooms of the Father Mathew Hall lighted up as much as possible, and this shed a considerable amount of light on the mass of debris opposite. In addition to this, numerous lighted lanterns and candles were held aloft by a body of willing assistants who stood around on the heaps of the stones, mortar and timber”. At about 10.30 the rescuers heard “stifled moans and calls for help” from deep down in the rubble, and the assembled crowd was silenced. After about three quarters of an hour, one of the firemen brought out of the rubble one of the two Fitzpatrick brothers (Andrew and Edward) whose “appearance was greeted with a loud outburst of cheering from the crowd”. The boy in question was John Shiels, aged only 3 years old, and Mrs Fagan was his aunt. “Now and again there was a lull in the voices of the workers, while a dead body was reverently removed and placed in the ambulance. The stillness was carried to the big crowd outside the police lines, and many fervent prayers were offered for the repose of the souls of those who had met with such an untimely end”. “While the rest of the city was at peace the silent, heart-broken relatives of the victims in this awful catastrophe waited patiently the operation of the willing volunteers with the lingering hopes that those they loved might be rescued from the debris…There was no hysterical wailing as the hours passed. That had given way to the silent intensity of tragedy”. The next morning the sun was shining brightly on the scene of the disaster. Only now could the full magnitude of the damage be appreciated. Over the next few days the newspapers gave confused and conflicting reports about the number and identity of those killed or injured. It was only three days later, at the Coroner’s Inquiry, that a full and accurate list of those killed was made available. These were; Hugh Sammon (17), Elizabeth Sammon (4½), Nicholas Fitzpatrick (40), Elizabeth Fagan (50), John Shiels (3), Peter Crowley (6) and Margaret Rourke (55)”, all from No. 66 Church Street. “During all their arduous toil their only refreshment was cold water, but if earnest thanks and appreciation are any reward, I for one tender them to the fullest extent”. Ironically,the letter was addressed from No. 66 Church Street. Christiaan Corlett is an archaeologist, historian and photographer. He is author of Darkest Dublin: The story of the Church Street Tenement Disaster and a pictorial account of the slums of Dublin in 1913. This entry was posted in Labour History, Social History, Tenement History and tagged Christiaan Corlett, Church Street Tenement Collapse, Darkest Dublin, Dublin Tenements. Bookmark the permalink. How sad never thought tenements were dangerous at least our flats were very safe have been redone but still I great shape. That was an extremely interesting piece of writing. Thank you. My great grandparents lived at 72.2 in 1901. Phillips. My grandparents lived in 66 Church St in 1909 but had moved to 64 by 1913.